Take I-90 east. Exit at W 25th St and continue straignt to Scranton Rd. Turn left on Scranton Rd to Starkweather Ave. Turn right on Starkweather and follow to St Theodosius Cathedral (733 Starkweather). Take I-90 west/I-71 south. Exit W 14th St and continue south to Starkweather Ave. Turn left on Starkweather and follow to St Theodosius Cathedral (733 Starkweather). Take I-77 north to I-490 west, exit W 7th St. 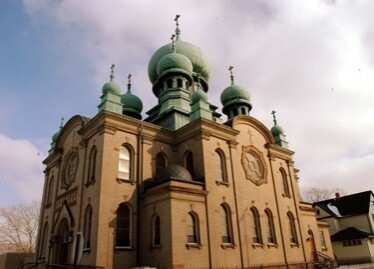 Turn left on Starkweather Ave and follow to St Theodosius Cathedral (733 Starkweather). Take I-71 north to exit W 14th St. Continue north to Starkweather Ave. Turn left on Starkweather Ave and follow to St Theodosius Cathedral (733 Starkweather). 9:00 AM Divine Liturgy, fellowship Hour.